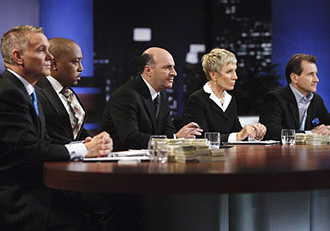 Performers include: Robert Herjavec, Kevin O’Leary, Barbara Corcoran, Kevin Harrington, and Daymond John. In these tough economic times, it’s difficult for someone who possesses an invention or owns a small business that’s poised for growth to get a loan for a risky venture. Some have been laboring on their ideas for years or even decades. They’ve invested large amounts of money and are often being pressured by friends and family to throw in the towel. Others have simply never had access to the means to live out their dreams, until now. Enter the “Sharks” — five multi-millionaires who lifted themselves up by their bootstraps to make their own entrepreneurial dreams come true and turned their ideas into empires. Each episode, ambitious entrepreneurs from across the country present their breakthrough business concepts, products, properties and services to the panel of ruthless investors. Their goal is to get these merciless moguls to invest their own dollars in the concept. Convincing real-life millionaires to part with their own money is no easy task, because when the idea is poor, the Sharks will tear into the ill-prepared presenters and pass on the idea with a simple, “I’m out!” — sending them running for the exit. But these Sharks aren’t just out for blood, they too have a goal: to own a piece of the next big idea. Entrepreneurs will often be asked to give up a large percentage of their companies’ equity in order to get the investment they need from one or a combination of the Sharks. But, when the Sharks hear a really top-notch idea and more than one of them wants it for themselves, a war between them erupts. The once-desperate entrepreneur can rejoice when the Sharks reveal their true interest in the product and can hopefully negotiate for a bigger piece of the pie. Shark Tank: Poor Premiere Ratings; Cancel It or Keep It? Seriously, how is this show even still on? Does he own the network or something? Seriously…4 time Emmy award winning show on its 10th season! You have no taste in GREAT shows! What gives Kevin O’Leary the right to call contestants “Cockroaches.” That is a great insult to compare them to one of the filthiest insects. O’Leary is the cockroach. And why is ABC complicit in his insults. They need to put a stop to them and a stop to O’Leary. Viewers are beginning to feel O’Leary thinks his money puts him above others…it doesn’t! He is scum and needs to be replaced on the show by someone more civil. LOVE THE SHOW,HOPE THEY NEVER CANCELLEDE IT. NEVER MISS IT. KEEP IT GOING.